Handpoured candles using soy wax + a cotton wick. Homecoming candles use 100% soy wax, lead-free cotton core wicks and a blend of the purest essential and phthalate-free fragrance oils. 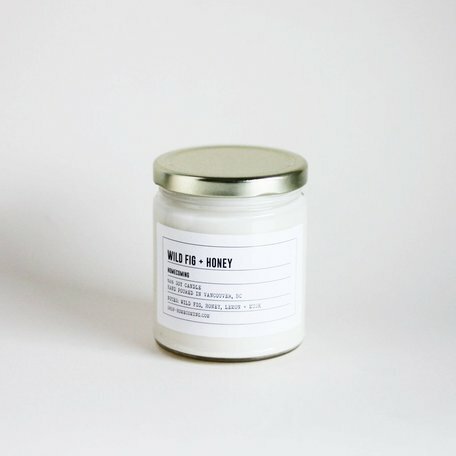 Our candles are preservative and petroleum-free, cruelty-free and 100% vegan. The first time you burn a soy candle, ensure it burns long enough for the wax to pool all the way to the candle’s edge (about 1 hour). This ensures a “memory burn”- the candle will burn down cleanly from then on. Burn for up to 4 hours at a time. Let cool completely between uses, about 2 hours. Never leave a candle unattended or burn if there is less than 1/2 inch of wax.